North eastern Brittany has a great Medieval heritage, with a handful of towns that have retained a quaint Middle Age charm. This corner of the French region also has much older megalithic sites that should not be overlooked, not least because one of these sites is the largest of its kind in the World. Earlier in the year I visited the Carnac area on the southern Brittany coast. That area is well known for its concentration of some truly enigmatic megalithic sites, from the Carnac standing stone alignments, the diverse megalithic arrangements at Locmariaquer and the passage tomb on the island of Gavrinis. While I was there I saw a map showing the menhirs and megaliths of Brittany and was surprised to learn that there were similar concentrations of these sites elsewhere in the region, not just around the Baie de Quiberon as I had long thought. And one of these other concentrations can be found in north eastern Brittany, not far from Mont Saint-Michel and the various Medieval forts and castles in that area. Given I do not live that far from Brittany, I decided on a weeks break exploring these megalithic sites and some of the Medieval castles. And of course, that gave me an opportunity to check on the progress at Mont Saint-Michel since my visit there in June. I was so lucky with the weather (just look at the blue sky in the photographs), but what I was thrilled to see was the final colours of autumn. One of the most spectacular sites is La Roche-aux-Fées, or the rock of the fairies – but more about them later. 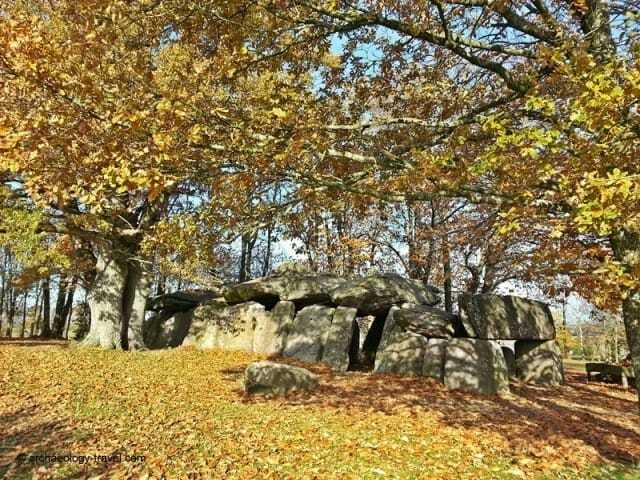 This particular megalithic monument is the largest dolmen structure in the World. Strictly speaking, this structure of over forty-one enormous stones from about five kilometres away is what archaeologists call a ‘covered alley’. The alley is created by a series of dolmens (two upright stones, holding a cap or table stone) arranged side by side to form a passage (hence these kinds of structures have also been termed passage tombs) or an alley. The passage here is twenty metres long, and at over four metres in height at the highest section, it is possible to walk upright inside it. Also, there is a large visitor’s centre (open during summer only) and a picnic area (where I had my lunch in glorious sunshine for December), which I am told has lots of useful information about other archaeological sites in the area. And there are about five other menhir sites in the area – I managed to get to two of them on the same day as visiting La Roche-aux-Fées. On the outskirts of the town of Sel-de-Bretagne are two standing stones, that are officially known as ‘les menhirs du Champ de la Pierre et du Champ Horel du Sel-de-Bretagne.’ The two stones are very different in shape and colour; one is a greyish-red schist and the other white quartz. 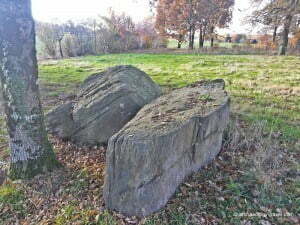 They were placed about fifty metres apart, on a slight rise that has a wonderful view of the surrounding countryside. 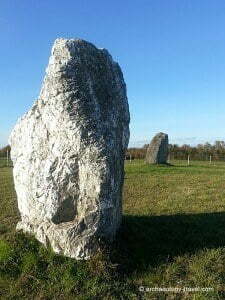 The menhirs have been fenced off from adjacent agricultural lands, and a bench as been provided for visitors to site and contemplate whatever it is one thinks about when looking at enigmatic standing stones like these. There are also menhirs at the nearby towns of Theil-de-Bretagne, Janzé, Retiers and Saulnières. The two ‘menhirs’ at Saulnières are now on private property and therefore not accessible to the public. As they appear to be nothing more than fallen stones, visitors to the area would not be missing out if they missed this site and focussing on the others instead. The two stones at Saulnières may be fallen (see the photograph), they are known as La Table-aux-Fées Saulnières. And the cluster of houses around them, a very small hamlet, goes by the same name. 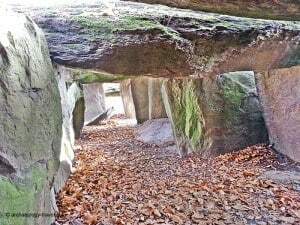 As with many other menhirs and megalithic sites around Europe, this little cluster of sites in north eastern Brittany are also explained by local folklore traditions associated with fairies. 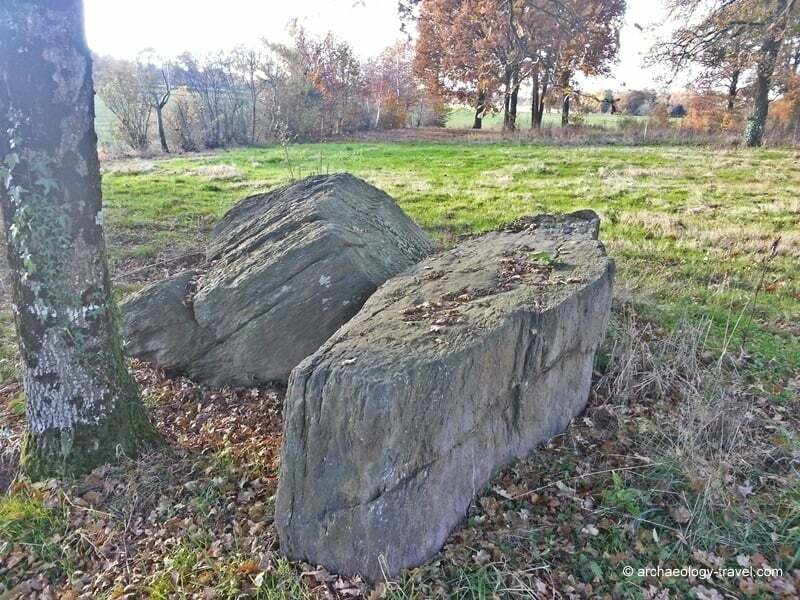 As I pointed out above, the site I mentioned first is called the ‘rock of the fairies’ because it was the fairies who are said to have brought the large stones from the nearby quarries and erected the structure. Folklore goes so far as to say that each fairy carried two stones, one under each arm. After delivering stones to La Roche-aux-Fées the fairies would then return to their quarry where they would eat their meals and rest. But, so it is said, they did not have a table at the quarry and were forced to use the stones that are now called ‘La Table-aux-Fées’ at Saulnières. According to legend, the chairs were once present about five or six metres from the table but these have now disappeared. When the fairy collecting stones at Sel-de-Bretagne learned that they were no longer needed, she simply dropped them and they landed upright where we see them today. Local legends do not explain why the fairies built the covered alley at La Roche-aux-Fées. But, folklore records that lovers wishing to get married would visit the stones at twilight, when they would go round the structure in a different direction to each other. While doing so, they would count the stones. And, if the numbers they arrived at were within two of each other, it was said their marriage would be a happy one. Great archaeology, and fascinating local legends – what more could an archaeology traveller ask for! 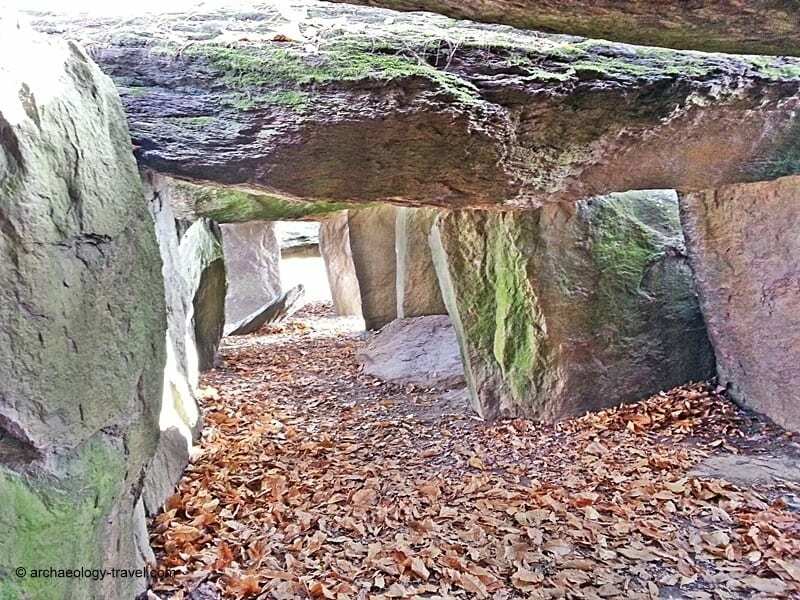 For further archaeological information about these three megalithic sites, their location and visiting them, see the list of archaeological sites in Brittany. When we were in Brittany 3 years ago, we were fortunate to visit the Carnac stones, but didn’t have time to go hunting the others. How fortunate you are to live close enough to follow in all those fairy footsteps!